I'm coming up for air after three weeks of hard work in hibernation, with another two to go. This course is pushing me into new places and at the same time pushing old irritating buttons. Being in the company of over two hundred artists all working on the same assignments is both inspiring and overwhelming. Suddenly I've been dragged out of my familiar little doodley world, and it hasn't always been comfortable. Comparing my work to others, serious bouts of self-doubt and forgetting how to have fun - these are the old demons (mates of our old friend Mr Perfectionist) that have been popping up and putting a multitude of spanners in the works. It's a good thing though, all this turmoil. I have faith that it'll all settle down in the end and there'll be something new and wonderful in its place. In the meantime, I'm keeping my eyes on my own work and mostly resisting sneaking peeks at other people's until the job's done. 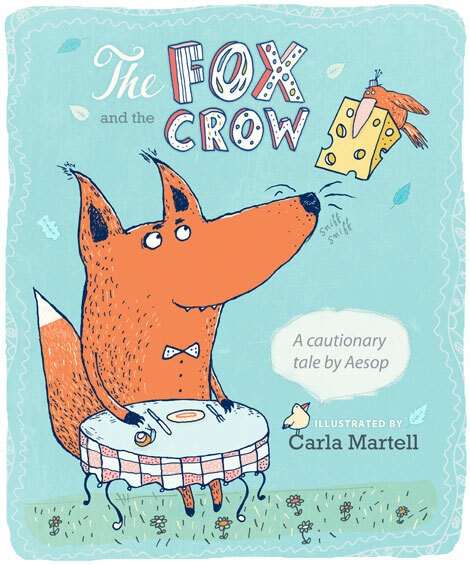 This is last week's job, by the way - to illustrate a children's book cover of the Aesop fable 'The Fox and the Crow.' Even though he's not very foxlike, I had fun drawing him, and that (as I'm discovering) is the most important thing. Awww! Your cover looks great! Such wonderful, whimsical characters!